A beautiful Madison day deserves a delicious meal. The sun was shining and Capitol Square was crowded so I went to the food cart with no line: the Good Food cart. 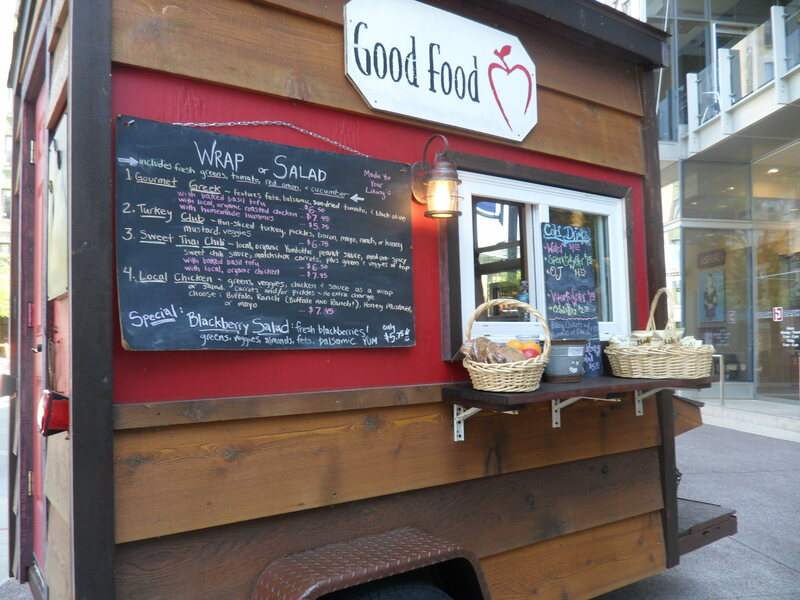 They specialize in wraps and salads with fresh ingredients and have changing specials (the Blackberry Salad when I was there) as well as Sweet Thai Chili. 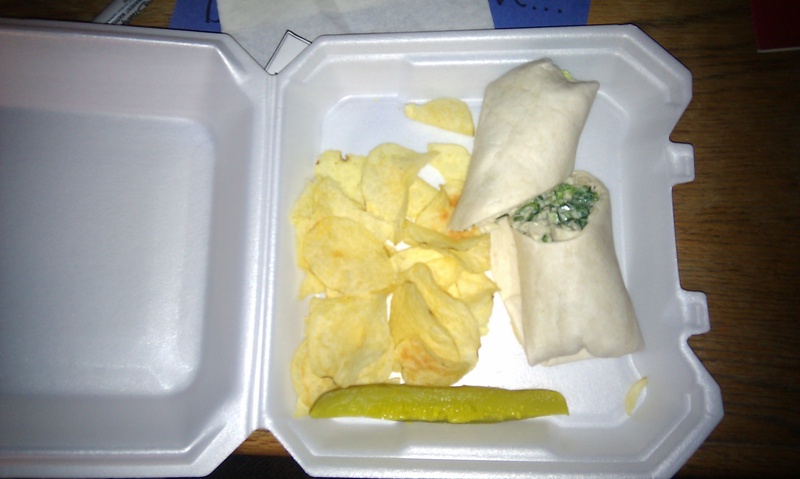 I asked the chef what she suggested and she recommended the Gourmet Greek wrap-I was still recovering from my dismal gyro from Mediterranean Cuisine so I skipped that and got the Turkey Club wrap. You could choose your sauce and fillings. I’m bad at making decisions so I said “I’ll take everything.” Very smooth of me. The lady asked me for my name so she could notify me when my order was ready. I was the only person there so this seemed a bit silly but it was a nice personal touch. I paid my $6.75 and waited about two minutes before being handed my lunch. The tortilla was stuffed with fresh lettuce, tasty turkey, crunchy bacon, red onions, juicy tomatoes, sweet honey mustard sauce, cucumbers AND pickles. And it was delicious. Really incredible. All the ingredients meshed together really well making a simple meal satisfying. I announced how great my lunch was after every bite to annoy my champions who were chewing on their not-so-great food cart selections. My Turkey Club wrap from Good Food. It's OK to be jealous. The wrap wasn’t very big (bigger than Lisa’s mini one though) and it didn’t leave me full but that is a trend I’ve been noticing among our food cart explorations. Maybe those sides like cookies or chips are worth investing in. I also think it was a little pricey but I expect to pay a little more for fresh ingredients. I can’t wait to visit again and try a yummy looking salad. I would like to give Good Food wraps extra props for portability-I could roll the foil off the tightly wrapped tortilla as I ate. This prevented the honey mustard sauce from dripping on my hands and clothes and, for me, using no napkins during a meal is an extraordinary feat. Usually only obtained when eating something like cereal. Or gum. It’s a beautiful, sunny day as I scramble to get to work on time. 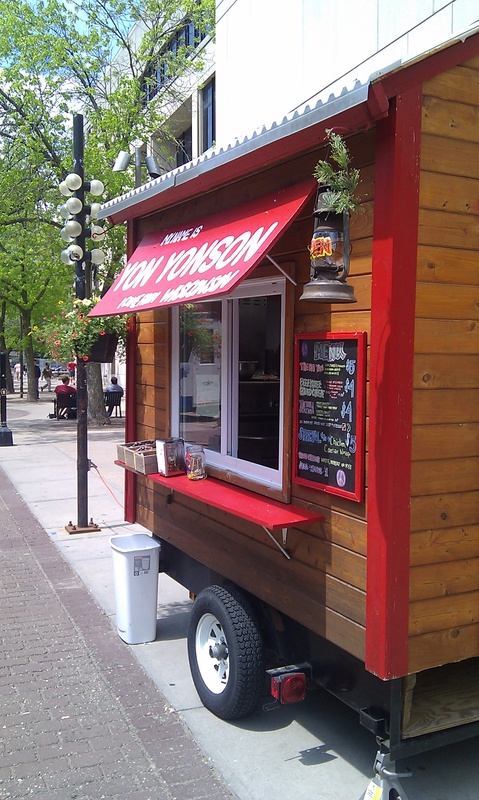 I need a food cart that has no line, is easy, quick and portable. Of course the cutest cart in Library Mall sticks out to me and I’m pleasantly surprised when a very jolly man greets me with a smile and comments on the spectacular weather Madison is finally seeing. The wooden cart reminded me of an up north, small cabin and has “Wisconsin” in the cart’s name. What would you expect to find? Brats? Cheese curds? Cream puffs? Something greasy, right? Wrong. By the looks of the cart, it isn’t easy to distinguish what type of food they serve until you walk up to the cart to look at the menu. (And once you’ve done that, if there is no line, the owner has already started a conversation and it becomes too awkward to turn around and leave the cart.) Thankfully, I was content with the food choices. 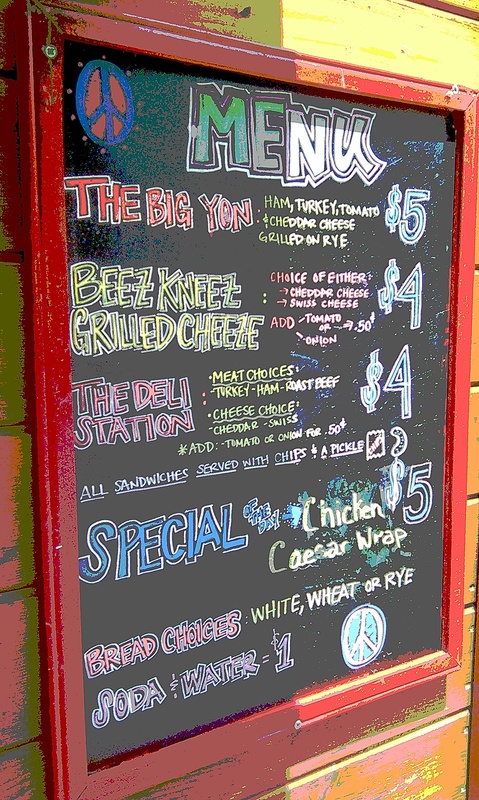 They offer grilled cheese deli sandwiches with chips (a handful from the bag of ruffles chips sitting in the sink) and a pickle on the side. 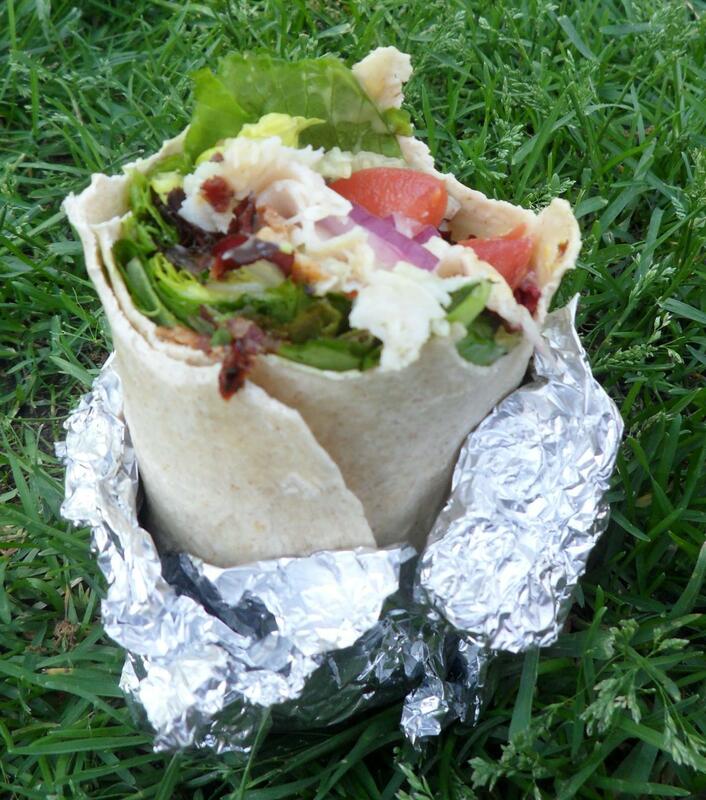 I choose the special of the day: a Chicken Caesar Wrap for $5. The wrap was fine. There was nothing spectacular or out of the ordinary about it. It tasted just like any other Chicken Caesar Wrap with crisp lettuce and a lot of dressing. The problem was that it was just as cute as the cart. However, when a meal is cute, it implies that it is tiny. That is exactly what this was. A cute and tiny wrap. Maybe I’m just a typical American wanting as much food for my money as possible. (So in retrospect, maybe Yon Yonson’s is a good and healthy change for my diet). 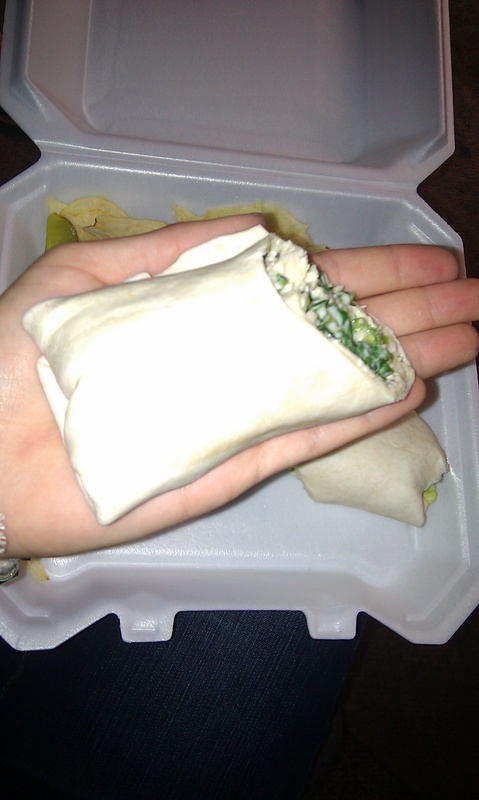 But if I just around the corner to the union, I can get a wrap at least twice the size for only a dollar more. All in all, the cart has nothing wrong or bad, but the serving is small for the price and not necessarily a Wisconsin classic. I would potentially go back and try the grilled cheese if I was running late again and needed a quick, healthy bite (and then maybe the overall plate score will get bumped up). But when I go to a food cart I want something fun and unique that I can’t get any other time of the year, except during food cart season.